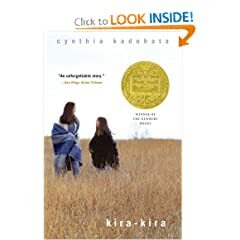 The 2005 Newbery Award winning, Kira-Kira, is Cynthia Kadohata's debut in middle-grade fiction. In Japanese, the word kira-kira (kee' ra kee' ra) means "glittering". Lynn is the older sister and in the beginning of the book she teaches Katie, who is the narrator, to view and describe life in terms of kira-kira. As Katie remembers it: "Lynn told me that when I was a baby, she used to take me onto our empty road and night and look at the stars while she said over and over, "Katie, say 'kira-kira, kira-kira' " I loved that word! When I grew older, I used kira-kira to describe everything I liked..."
Katie and her family move from a Japanese community in Iowa to the Deep South of Georgia, Lynn is there for Katie to explain life and the world around them. In turn, when a baby brother, Sammy, is born into the family then Katie is there for him like Lynn was for her. These brotherly and sisterly bonds are explored in this book through good & sad times. I really enjoyed that aspect of this book. Lynn is 9 and Katie is 5 when the story begins and I expected the voice of the book to portray Katie's age then as the narrator. But as Katie grows, I didn't feel that the voice of the story grew with her and it was always told at this level of simplest terminology. Perhaps, it is because I have children and I see regularly the difference between a five year old and an 11 year old in the way they talk and think. So, this might just add up to be a personal reflection on my part. But that was one thing that bothered me about this book although I appreciated the ideas and thoughtfulness that book tried to convey. As the book moves on, deeper concerns like Lynn's disease become an issue and Katie struggles to understand what is happening as it takes her parents a very long time to explain things to her because I don't think they even knew why either. This keeps the reader guessing and wondering what exactly was wrong with Lynn since what Katie thought was anemia didn't seem to add up, at least in my mind, to how serious it seemed. Eventually, things reveal themselves and although sad, it is what the reader needs to know in the end. I bought this one a couple weeks ago and am looking forward to it. I've read very little books about Asian cultures, so it should be interesting. I can't wait to hear what you think, Amanda.